This week marks a very large milestone in telecommunications in the UK - it's a decade since Telewest launched the UK's first commercially available broadband service. Cable broadband had been talked about and technical trials undertaken in both Telewest and NTL before then, with a number of aborted attempts by the Internet people in Telewest (the Cable Internet team) to launch a cable broadband service in the years preceding - much of which was down to doubts about how much consumer demand there would be! Telewest had also launched a limited service available to schools in the Edinburgh area, with those on the Ecademy project getting one of these lovely compact (not) cable modems to power their service: By late 1999, it was agreed that we would launch a broadband service (or "HSD" as it was known then - High Speed Data, later becoming "HSI" - Hi-Speed Internet) and the Cable Internet dialup team along with specialist consultants from Ernst & Young, Hewlett Packard and others formed a project team to roll it out. A sales team was established based out of Gillingham which only sold broadband - in fact any inbound broadband sales attempt to the general sales number resulted in the call being transferred to the dedicated sales team! - and that was also the headend we first launched the service from with customers in Maidstone being the first people in the UK to get a commercial broadband service. 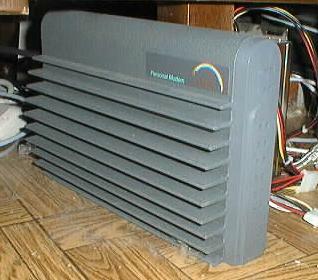 The service launched on March 31, 2000 and was priced at £50 per month for a 512Kb broadband connection. Yes, that's Kb, not Mb. The price quickly dropped to £33 per month, NTL and BT followed with their broadband launches and the UK broadband market was born. We came up with a new brand for our broadband service, which was blueyonder. In true brand consultant style it was not Blueyonder, Blue Yonder or any other concoction - one word, all in lower case. At the time our PR team spend an inordinate amount of time correcting media sources that got it wrong! The service was marketed on being all the things that dialup wasn't, highlighting that the Internet would no longer tie up your phone line when someone called you and that it was an always on connection - no more negotiating the tedious dialup login process. 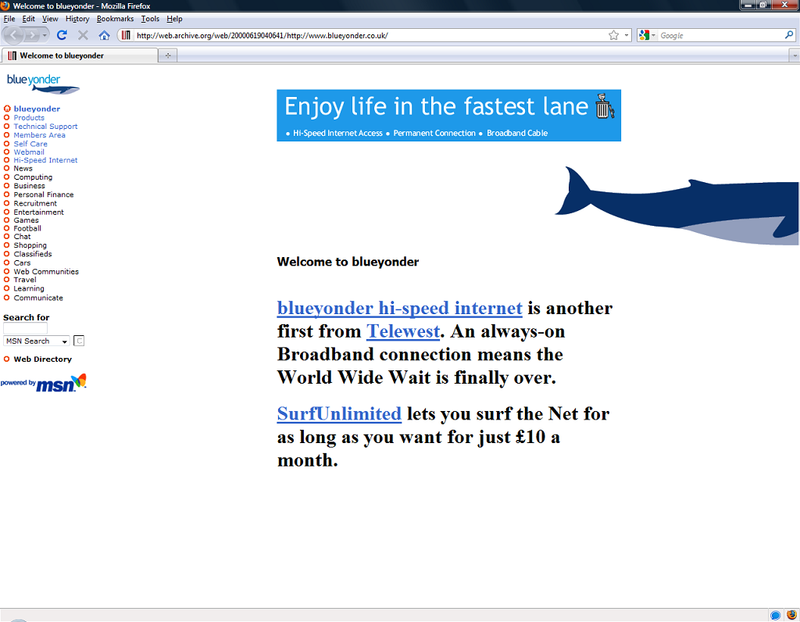 The symbol of blueyonder was the blue whale, there to symbolise the power of broadband and our first website included content from MSN in a co-branded deal. The first website is preserved on the Internet Archive's Wayback Machine: When the service launched the vast majority of Telewest's Internet customers were still on dialup and it took time to get people migrated over to broadband connections, with many amusing stories of how we described the benefits to customers - after all we were still learning ourselves. The traditional home of Telewest was always Woking, and the blueyonder launch led to much change in that model for our technical teams - with technical support for broadband being setup at the Albert Dock in Liverpool (which is still one of our key technical support sites to this day) and a large infrastructure being setup at nearby Knowsley to support the service (also still a key site), from mail platforms to network enabling systems, test platforms and plenty more. The project team moved around the country rolling out broadband as they went, introducing a whole slew of new acronyms to the business in the process - such as uBRs, DHCP, TFTP and any TLA you could think of. By the end of 2000 we'd rolled broadband out to all of Telewest's regional headends and were working on the first speed uplifts. I remember the rollout as being the best time of my working life, where we were all doing long hours but truly breaking new ground under the leadership of Gary Jennings, Graham Sargood, Chad Raube and Howard Watson - who are all well known for their cable connections (pun intended) to this day. For my part I had joined Cable Internet as webmaster in 1998, which in those days meant I designed and built all the web pages along with writing most of the content for them (for many years afterwards all the help articles on the website were mine!) but also building, configuring and operationally running all the web servers that the sites ran on. This all had a major overhaul with the blueyonder launch including the integration of all the MSN content and setting up new servers - in the days when load balancing was a foreign concept to systems people and all the sites ran on single servers with backups sitting on my desktop PC! I also had to write heaps of customer communications, briefings for internal audiences and help out the PR team with how they were going to explain broadband to journalists - a very amusing thing to have done when you look back on it. To think we've come from there to 50Mb broadband - with 100Mb announced and 200Mb being trialled - in less than a decade is a testament to me in what we actually achieved in being first to market and with the advantage of the superior cable technology, and they are times I will always remember fondly. As the week continues I'll look to share some more of our decade of broadband, including a guest blog on the early days of broadband technical support. The Independent on Sunday also has a good article today about the first decade of broadband too. Nice article - brings back memories from back in the day. Are you going to cover all the other glorious launches 1Mb, 10Mb, 20Mb etc. Hi Alex. Very enjoyable read, brings back some great memories! I worked in the Gillingham HSI sales team working under the venerable Lindsey Smith, not from launch mind, maybe joined a year or so later. Was still a young product though at that point and I think I started work just in time for it to start to go "mass-market", great buzz about it. Good times. All things must pass though, we were laid off in mid-2004. I do, nice to hear from you Steve.